Tick….tick….tick….tick….I am awake. It is the middle of the night and my brain has gone into monkey mode. No position is comfortable. No amount of yoga breathing will distract my busy mind. No amount of sheep counting sends me into dreaming. I have a cat firmly asleep on my legs. When I try to move, said cat goes into noodle mode and protests with a tail twitch. The last time I looked at the clock it was 3:42 a.m. If only my cats were concerned about the quality of my sleep. Eventually I drift off. In what feels like only minutes, I am jarred awake by my husband’s alarm, a song by Queen about bicycles. I groan. For a minute, the bed cat remains a full impact noodle. Another cat thinks it’s time for breakfast. Cat number three starts clawing on the cat tree. Full noodle cat is now walking on my chest. My husband is now snoring and oblivious. I give up any hope of more shut eye and lurch downstairs to rectify the urgent dish bottoms issues of the cats. Maybe tonight will be better. Hardly anyone I know ever saw this painting. I created, Zeno, for donation to a local art center for a fundraising event, the kind where local artists hand over a piece, then, during an invited members-only reception, the artworks sell to the center’s patrons. I was excited to have a piece in this show. Being new to the area, I saw it as an opportunity to have a lot of people see my work. On the night of the occasion, my then-boyfriend and I arrived at the reception early but I couldn’t find the painting anywhere! I quickly discovered that Zeno was one of the first pieces that sold that night. I never saw it hanging in the gallery, though I did locate the orphaned label, and the empty space on the wall. I never even signed the front of the work. We strolled through the galleries, looking at all of the art. Despite the swanky surroundings and champagne, some of my enthusiasm for the event had waned. Plus, the food options for vegetarians were next to nothing. We left the party early. While I was excited that my piece sold, I was disappointed that I didn’t get to see it in the gallery– nor did anyone else– because it disappeared so quickly. That art center stopped hosting fundraising events in the same way the year after, so unknown artists like me were no longer invited to participate. I’m grateful for the opportunity to have sold my work for a good cause, but I still wish I’d kept this painting and donated a different piece. As it turns out, this night lives as one of my favorite date nights ever. I recall many details, including what I wore (I went shopping for an entirely new outfit,) who we ran into (people from work who did not know we were dating,) the souvenir glasses stamped with blue stars, (still have one of them,) and the lovely desserts we found after we left the reception (at a place to which we returned frequently.) As luck would have it, the then-boyfriend became my husband. Things don’t always turn out as planned, sometimes they turn out better. When you get a chance, prowl on by the awesome and comprehensive Katzenworld site to see my occasional guest entry, the Friday Art Cat, where you’ll find some arty cats drawn or painted by me! 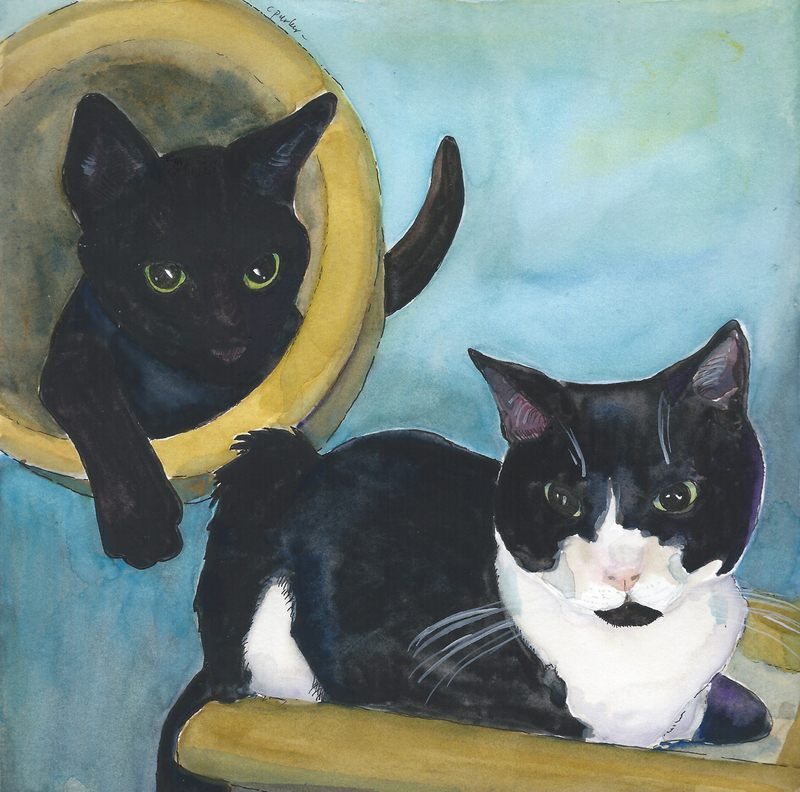 This is a fan painting I made of Nubia and Oliver, just two of the felines you’ll find in the World of Cats that is Katzenworld.